It doesn't matter what your favorite Christmas breakfast is, you can probably get it to look like a Christmas tree if you try hard enough. Here are some ideas to help you out. Love waffles? Layer some green waffles and then trim your Christmas tree waffles with fresh berries like Rutherford Family Happenings. 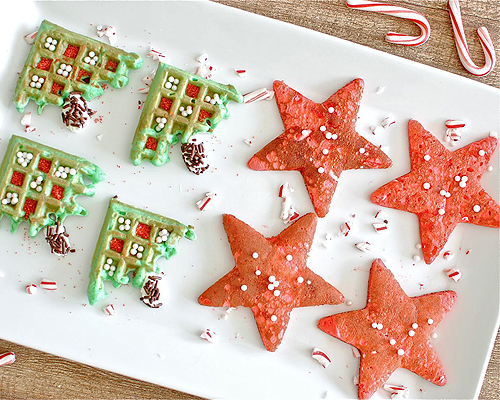 Or you can just use a single waffle triangle to make a simple Christmas tree waffle like Quick Dish. 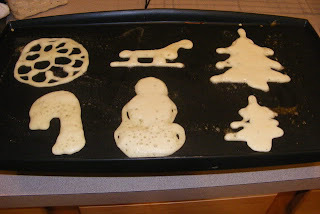 If you prefer pancakes, use a squeeze bottle to draw out some Christmas tree pancakes. 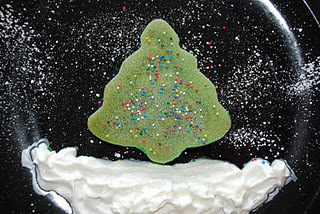 Or you can always use a cookie cutter (during if it is metal or after if it is plastic) to create a perfect Christmas tree shaped pancake. If French Toast is more your thing, layer a couple of slices to create this festive French toast Christmas tree. Or cute your french toast into stars to create this stacked French toast Christmas tree from Spice Up Your Life. so fun! i saw the first one on pinterest, love the other ideas, too!